Prior to the opening of the NHL's free-agency period, five NHL veterans, including Vancouver Canucks defenceman Keith Ballard, have been placed on unconditional waivers according to a source. Defenceman Tom Gilbert is on his way out in Minnesota, Nick Leddy is back with the Stanley Cup champion Chicago Blackhawks, and the New York Islanders have parted ways with goalie Rick DiPietro's long contract. Wednesday proved to be a busy day for NHL teams, who scrambled to make subtractions and additions before the free-agent signing period opens at noon on Friday. Gilbert was one of five players waived for the purpose of contract buyouts. The others were Vancouver defenceman Keith Ballard, Detroit defenceman Carlo Colaiacovo, Nashville forward Sergei Kostitsyn, and Buffalo forward Nathan Gerbe. "Due to the NHL salary cap decreasing this season, we needed to make this difficult decision to give the team more flexibility," Wild general manager Chuck Fletcher said regarding the team's decision to waive Gilbert. Some teams re-signed their players, too. Leddy agreed to a two-year contract before he was eligible to become a restricted free agent. "I'm thrilled to have the opportunity to remain in Chicago," said Leddy, who had two assists in 23 playoff games for the Blackhawks. The Dallas Stars announced the signing of Jordie Benn to a three-year deal, preventing him from becoming an unrestricted free agent. DiPietro, meanwhile, cleared waivers on Wednesday, allowing the Islanders to buy out what is left of the 15-year, $67.5 million contract the former No. 1 draft pick signed before the 2006-07 season. Washington defenceman Jeff Schultz also cleared waivers and is expected to have the remaining two years and $6 million left on his contract bought out. The series of moves continued to alter an ever-fluid, free-agent class, whose marquee player is already off the market. That would be Vincent Lecavalier, who agreed to a four-year deal with the Philadelphia Flyers on Tuesday. The former Tampa Bay Lightning captain hit free agency after the Lightning bought out his contract last week. The Flyers followed up on Wednesday by issuing qualifying offers to retain the rights to defencemen Erik Gustafsson, Oliver Lauridsen, Brandon Manning and forward Eric Wellwood. The Flyers declined to make offers to defenceman Blake Kessel and forward Mitch Wahl, allowing both to become unrestricted free agents. The St. Louis Blues re-signed defenceman Jordan Leopold to a two-year contract. Leopold is a 10-year veteran who had two assists in 15 regular-season games with St. Louis after being acquired by the Blues from Buffalo on March 31. Teams had until Wednesday to place players on waivers in order to buy out their contracts. Under the collective bargaining agreement, teams are allowed to buy out contracts of two players over the next two seasons. The clause was included to give teams the opportunity to clear space under the salary cap, which is dropping from $70.2 million to $64.3 million. Contracts of bought-out players won't count against a team's salary cap, though the players will be paid two-thirds of their remaining salary over double the years remaining on their contracts. Bruins general manager Peter Chiarelli is confident he will reach a deal to re-sign goalie Tuukka Rask, while adding he anticipates backup Anton Khudobin to test free agency. Chiarelli is also having a change of heart on Jaromir Jagr. He said he would consider re-signing the veteran forward now that the team expects to lose Nathan Horton in free agency. "Yeah, I'm open to all options and alternatives," Chiarelli said in regards to replacing Horton. Maple Leafs defenceman Mike Komisarek announced on his Twitter account that he is on his way out of Toronto. Set to make $3.5 million over the final two years of his contract, Komisarek is expected to be bought out after spending part of last season playing in the minors. The Florida Panthers announced they used a standard buyout on 36-year-old defenceman Filip Kuba, meaning the remaining year of his contract will still count against the salary cap. Kuba had a goal and nine assists in 44 games last season. In Minnesota, Gilbert is a seven-year veteran, who was set to make $3 million in the final year of his deal. The Wild have one of the NHL's most expensive payrolls and needed to make the move to free up space. From Bloomington, Minn., Gilbert failed to make much of an impact with his hometown team after the Wild acquired him in a trade with Edmonton in 2012. Gilbert managed just three goals and 15 assists in 63 games. Kostitsyn had one year left on his deal and was scheduled to make $3 million next season. The move didn't come as a surprise after Kostitsyn landed in coach Barry Trotz's doghouse last season, his third with Nashville. Kostitsyn is a six-year NHL veteran who had three goals and 12 assists in 46 games. Kostitsyn has hinted that he could be open to playing in Russia's Kontinental Hockey League next season. Ballard was scheduled to make $4.2 million in each of the final two years of his contract. 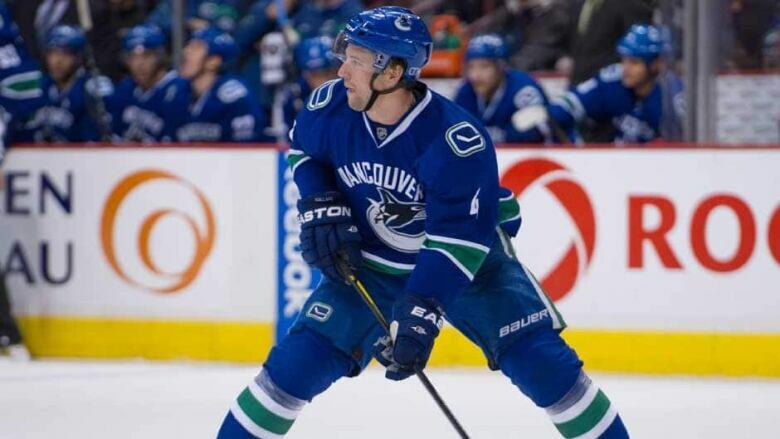 He is an eight-year NHL player, who managed just two assists in 36 games with the Canucks last season. The Sabres' decision to place Gerbe on waivers came as a surprise after general manager Darcy Regier indicated he had no plans to buy out any of his players. Gerbe had difficulty carving out a role during five seasons with the Sabres. Buffalo did re-sign journeyman forward Matt Ellis to a two-year contract. If Ellis doesn't play with the Sabres, the team is counting on him to serve as captain at AHL Rochester. Colaiacovo struggled in his first and only season with the Red Wings, failing to play to his two-year, $4 million contract. He had an assist in six games last season, and added an assist in nine playoff games.